I've been meaning to write this post for a long time. The problem was that I had too many thoughts about it and couldn't sort through which ones to tackle first, and which ones to leave off completely. It started with this story in the New York Times, about hugging in schools and the restriction thereof. Hugs happening all day? Needless hugging? I'd wait in line for some needless hugging (as soon as I could figure out what that was exactly.) We have metal detectors in our schools and this is what you're complaining about? Where do I start with what's wrong with that? Can't we be allowed to connect with each other without someone regulating it, defining it, and probably taking every bit of joy (and ultimately any real connection) out of it? Yes, there are dangers in not setting boundaries, especially for our children - but some things go beyond common sense. And then I thought about tango. Because I always end up thinking about tango. 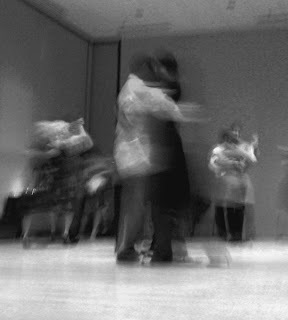 Does tango attract because it allows us a context to (as freely as we can) connect with another person? For 3 or 4 songs I can embrace and be embraced by another human being, whose name I may, or may not, or may never, know. For those few minutes we have the opportunity to tell our stories to each other with our dance, comfort each other and allow ourselves to be comforted by another person's physical presence in the music. All of this (for some there is more, and for some there is less) in a context that rewards connection instead of discouraging it. Outside of the milonga, we have to place boundaries between what is my pain and what is your pain; what is my joy and what is your joy. Reaching out to other human beings (certainly to ones you hardly know) is a sign of impulsiveness, weakness, neediness, even sickness. We're constantly conditioned to be self-reliant, self-sufficient, on guard, disconnected. That can't possibly be what it means to be human. Back to tango . . . Inside the milonga, we connect with our partners, the music, the floor, the other dancers while moving together in the line of dance. In the moment, our "sphere of influence" expands and becomes nebulous. We can reach out, ideally at our own pace and comfort, to all of those who would reach out to us. When the music stops we can go back to our lives - hopefully with traces of blissful entanglement, attachment, connection, still lingering over our skin. Yes, it seems to me that so much of what tango is about is what it is to be human, with all the implications of that phrase. Without that connection, and the acknowledgement of where the tango narrative touches our own story, we are not dancing tango. And because much of tango music is about the joys and sorrows, the poetry and passion of what it is to be human, it perhaps allows and encourages to be open to these feelings in ourselves and our partners. And to do that, as you say, in a place which is emotionally safe. There is much to be explored in this subject, as you have suggested; I look foward to reading other people's comments. Trust is certainly vital. Perhaps tango does nothing more than provide the place in which the connection may take place. Yes, there is such power and potential in the music, but whether we are able to accept and commit to that is something else. Certainly the intensity of the connection varies greatly from partner to partner. Tango "learned easily"? Hmm, not sure I'd agree with that... the basic steps perhaps. I remember when I began to dance tango in the UK. If someone offered me a close embrace I was unsure, it seemed too close. Now the embraces I love the most are the closest ones, the ones where we shift and 'snuggle in' until we are completely comfortable, and our hearts can touch: the hugs... I love it when the man is exactly the perfect height and shape for me and it feels like we fit and can become one. I'm sure that learning to love this closeness with strangers in tango has played a part in releasing my British reserve, and helped me to 'hug' life and the people in it more warmly. Big stuff? Maybe. But for me it is true.